This is a testimonial for Hoerner & Geer CPA’s and Amy Geer. Amy has worked with the MABA finance team for the last several years and has been MABA’s accountant for the last several years. She is a Quickbooks expert and has helped the board and our treasurer keep things organized. She also did a fantastic job as our February meeting sponsor. Thank-you Amy for all that you do! My testimonial is for one of our newest members, Orthopaedic Rehab Specialists, who just opened a new Okemos location. They have rehabilitated my knee, ankle, shoulder, and now working on my wrist. They always do great work! Thank you to Aaron and Kevin! My testimonial is for Kevin Damesworth. He has been a great President for MABA and has always worked to help grow the organization. Membership is up, we have accomplished many items on the strategic plan, and MABA is stronger than ever because of his leadership. Thank you for all that you have don for this organization Kevin! Big THANKS to Williams Carpet in Okemos! They not only provided a great quality of carpet/instillation but working with Keith & Diane created a "no worries" situation. Would use again! I would like to recognize Carol Bidigare from Primerica. She has been great to work with. She has put a financial plan together for me, given me great advice, and walked me through a plan to retire. Thanks to Carol I am now debt free! Thank you so much Carol!! My testimonial is for Chris Buck. Chris brings a tremendous amount of energy to his role in economic development for Meridian Township. He has gotten an amazing amount of things done since joining the Township and with creative and new ideas, he will continue to make our area the best in the county to live, work, and play! Thank you Chris for all that you are doing. 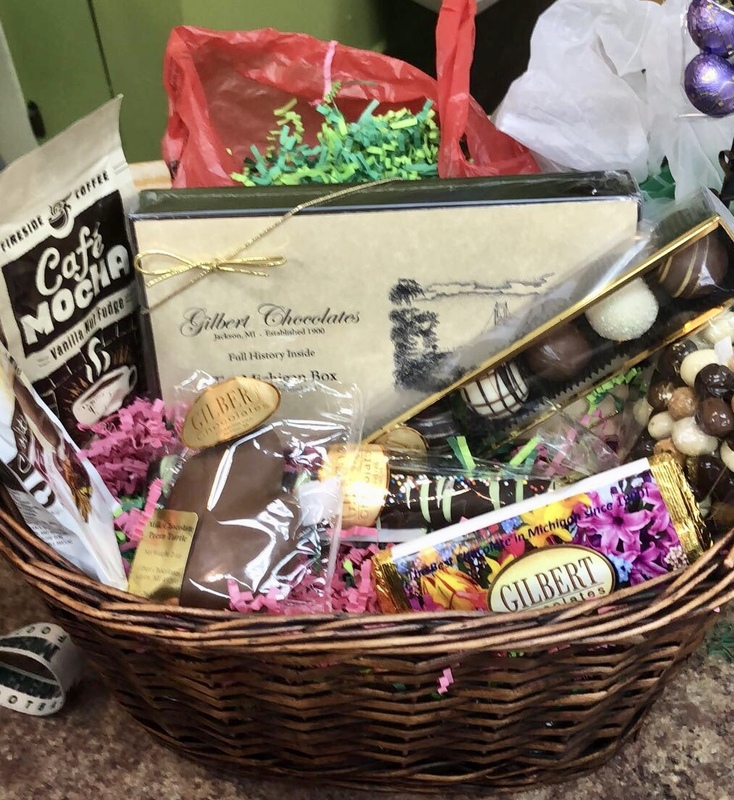 I have a testimonial for Gilbert Chocolates...did you know they do Gift baskets full of delicious varieties of...you guessed it, C H O C O L A T E S! They had it put together very quickly and even allowed me to include some business giveaways in the basket and wrapped it all up nicely for me. Highly recommend Gilbert Chocolates for your gift giving needs!!! My Testimonial is for Graff Chevrolet, they continue to provide outstanding service and they communicate so well throughout the process. They look out for your needs and offer great options to consider. From Sales, Service, and Community involvement they truly care about people and MABA members. Thank-you Graff for all you do! I have a testimonial for Gita Mahabir at Mahabir Wellness. I had thinning eyebrows and had been either filling them in with eyebrow pencils or eyebrow powder for years. It took time to do this every morning and I did not always like the results. Then I saw Gita's ad on Facebook and I was intrigued! So, I made an appointment and had Gita do the semi-permanent cosmetic eyebrow enhancement on me. She was very professional and did an excellent job of explaining everything about the procedure to me. Now I save time and my eyebrows look great every day! My testimonial is for Cullen Harkness at Harkess Law Firm, PLLC. Cullen was terrific in establishing a Power of Attorney for me for my mother. He did it in the most professional way and with a very quick turnaround time. He related very well to my mother and made the process very easy. Thanks Cullen. I would highly recommend Harkness Law Firm, PLLC to my friends, family and colleagues.